← Time to Favor Fake Grass? There Is No Shortage of ‘NEW’ to Try! At 65, I’ve seen and done a lot of things. Like most, I have developed routines over the years and like some, at times have gotten stuck in those routines. Everyone has a personal world in which they live. You get up, have your coffee, hop on the bus, get to work and then come home. Your world narrows when you don’t deviate from your routine. You stop learning, you stop exploring, and sometimes you even stop wishing. Things are good as they are, why change, why try something new. Often we get so enmeshed in our own little world that we think it is the only one there is. We lose the ability to marvel at new, or even find it. We think we have tried everything there is to try. Trying new keeps your brain active. Studies have shown that learning helps build connections in your brain, keeping you in better mental health. When you try something new, your brain is forced to build those new connections. Trying new makes time pass more slowly. When we follow the same routine all the time, there are no markers to differentiate one day from another and time seems to whiz by. When we try new things we mark the passage of our lives in new ways. Trying new gives you something to look forward to. The study, published in the journal of Applied Research in Quality of Life, showed that the largest boost in happiness comes from the simple act of planning a vacation. In the study, the effect of vacation anticipation boosted happiness for eight weeks. Trying new introduces you to different people. Beginning a new course of study, or a new activity or hobby or business can bring you into contact with a new circle of people. This allows you to build more human connections. Staying connected has been shown in multiple studies to be a predictor of better heath and happiness. Trying new keeps you humble. As we age and develop experience and knowledge of a variety of things, we can become overly impressed with our own intelligence and abilities. Putting ourselves on equal footing with other beginners or seekers can keep us humble. We too can fail. So are you eager to try something new, now that I’ve restated the benefits? What is on your bucket list – what new experiences or knowledge are you seeking? Try a new method of travel. Take a train, ride your bike, hike, ride the bus. Take a guided tour instead of designing your own trip. Go to a place totally different from your normal travel destinations. Ride an elephant. 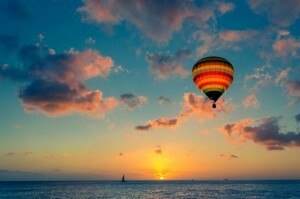 Take a hot air balloon ride. Do a pull up. Work back up to doing a headstand or somersault. Walk a balance beam. Swim underwater. Challenge your physical capabilities with new exercises, new sports, new work activities. Learn to cook. Make a pot. Carve a statue. Pour some concrete. Give a class. Lead a brainstorming session. Meditate. Become a mentor. Join a club. Volunteer in a national park. Save the seals (or any number of other worthy causes). And yes, write a blog post (I could use some guest posts!)! Pick a subject and become the family expert on it. Learn another language – after all there are many from which to choose – so many that it is hard to count them, according to the Linguistic Society of America. What new thing are you looking forward to learning, seeing, doing? I’m trying a new physical fitness and it is jogging! Before I only went to the gym and spent about 1-2 hours in there, but I stopped my gym membership to save less and I was a bit bored. So now, I’m trying to be consistent with my daily running together with my sister and I even make new friends. Good for you! I started jogging (which in my case was more like walking really fast) around age 50 and kept at it for several years. I even joined the company track team for Corporate Challenge! BUT, my knees started complaining and I switched over to walking, which takes longer but is gentler on my old body parts. I often avoid the new because of cost or a lack of confidence in my abilities. Fear rules my life. Trying something new has the potential for making time go by fast too though. What I mean by that is when you’re engrossed in a fun, exciting activity you usually forget about the time. Then, before you know it, time has flown by. It really depends on the activity and how captivating it is. You’re right, we should make efforts to try new things. We’re creatures of habit, so it can go against our nature, but most of the time it’s worth it to try something new. To me, it is possible for time to go by both rapidly and slowly while I am doing one thing. In the short term it whips by – because, as you say you are engrossed in it. Long term, it sets up markers so that you feel that more has happened to you, thus breaking up the sameness of your days and making things (at least to me) seem to pass more slowly. Good for you for staying active and curious. I don’t think trying new things make time pass slowly, I can travel for 6 months and feel like only a month has passed, but you sure are more conscious of where your time went. See my answer to Mr Utopia above! I’m in the middle of planning our next one too! Trying new things is what gets me out of bed each day. Life is our gift to experience, why not make the most out of it! That is a great philosophy. Looking forward is so much better than dwelling on the mistakes of the past.